I can say with confidence that this book is unique. 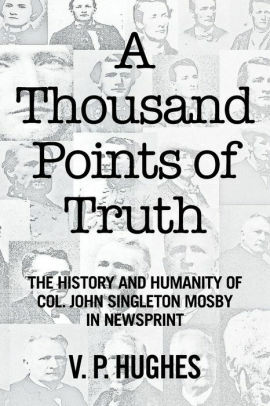 Although there are innumerable books, essays, articles and dissertations about Colonel John Singleton Mosby, none presents his life through the lens of the press from 1862 through 1916, the year of Mosby’s death. To illustrate the depth of the resources used, almost 600 newspapers and over 7500 articles were available and only size limited what eventually was included. Yet even with severe editing, the work is almost 800 pages long, thus assuring the reader that a great deal of new and fascinating information has been brought to the fore! The articles are supported by a thought-provoking narrative interpreting Mosby’s life referable to the major historical events of the times as manifested through press coverage. Yet this is not just a recitation of facts and press revelations, however interesting. Rather, the main thrust of the work is to correct past assumptions regarding Mosby’s life and especially those negative traits constantly reiterated in biographies and other works. As Mosby buffs know, such criticisms comprise denigration of his military value during the Civil War, his supposed post-war political “apostasy” and his character, especially in his old age. In all of these issues, this contemporary evidence counters the “accepted interpretation” of John Mosby as both a soldier and a man. For many years, V. P. Hughes has been drawn to certain historical figures whom she researched at great length and in considerable depth regarding not only the person of interest but the period in which that individual lived and his influence upon it. Over the years, she has studied such heroes as Sir William Marshal (1147-1219), Sir Harry (Hotspur) Percy (1364-1403), Admiral Horatio Nelson (1758-1805), John Churchill, First Duke of Marlborough (1650-1722), Sir William Wallace (1270-1305), Francis Marion (1732-1795) and the legendary figures William Tell and Robin Hood. The last three were of especial interest because they, with their few followers, engaged the most powerful armies of the time-and prevailed. Of course, John Singleton Mosby was another such champion-a man who defeated his adversaries with cunning and courage rather than brute military force.Yet Mosby became an even greater curiosity when during her research the author discovered that he had died twenty-five years to the day and hour of her own birth-May 30th, 9 a.m, 1916 and 1941 respectively. Although acknowledged as a mere coincidence, however curious, Mosby’s unique style of warfare and his astonishing success under the circumstances extant, made him of especial interest. Early on, her knowledge of the man centered around the Civil War, but then, copious written works as well as the opinions of past and present day Mosby sages brought to light his post-war life in a manner that seemingly disparaged and negated all the glories that had gone before. Finding this both troubling and unacceptable, when the opportunity arose to refute these calumnies and slanders, the author felt obligated to undertake what is, in essence, a posthumous defense of the man. It is hoped that this unique work will achieve the goal of undoing a great injustice and restoring to a noble American hero the respect and admiration he so richly deserves.